Mostly Translated News: Gettenka World War One Battle Royal History! So Sega just finished it’s livestream, which was pretty much just trailers. However, one game really caught my eye. No not Yakuza Zombie Chaingun Arm Of The End, but a game I thought was called Cute Samurai Smash Bros. SO CUTE!!! Anyway, I went on a tear looking for info. I tracked down the website www.gettenka.com through sega.jp (JOURNALISMS!!!). There I found mostly facts about an arcade card game I think. Hey, it was all in Japanese! But, I found another side called http://gettenka.com/ds/index.html which is basically just a flyer for the game. I tried to save and download what I thought was a PDF so I could post it here. But somehow I TRANSLATED IT!!! SERIOUSLY!! I love computers. This is what we’ve got so far. Hit the jump for the translated text. Scoop shock! Released in November! 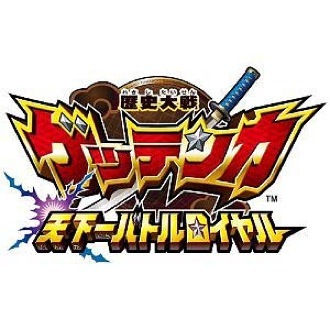 Battle against four Gettenka DS version! Gettenka how I found the DS to appear! 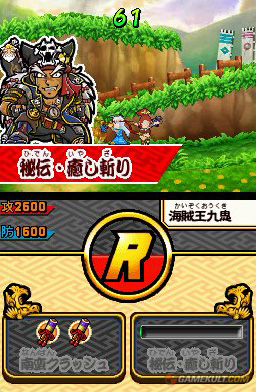 Moreover, it appeared in the Warring States Battle Action Battle Royal in which four people play! For details, follow-up wait! Ryoma Gettenkabatoru fought him! ? Never take a break and get booking! Note: Images are in development. Please let this come the North America! I want little Samurais to fight! Seeming that its a download game based off a Japanese arcade card game (from what I can tell), it’s a rather lofty dream. BUT DREAMS CAN COME TRUE!!! !